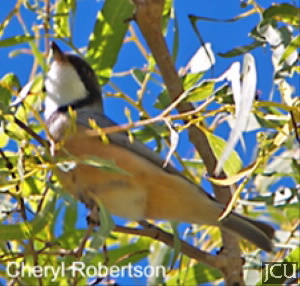 This nomadic bird is quite common on the Townsville campus. In the male, a grey head and back and tail, there is a white band at the base of the chest and the abdomen is rufous-coloured. The female is a duller olive-grey, and the underparts are buff-coloured with darker streaks particularly on the breast. Legs and feet dark grey, eyes brown, bill dark grey.